Globalization, it is not a new phenomenon (Stead, 2012) but has massive influenced in the late 20th– century around the world, which has strongly affected on urban system in Europe, economics, political, cultural, environmental dimensions. People speculate and make hypothesis about globalization is related to competitiveness of cities with strong economic, innovative and creative ideas or structure on city planning. Most of researches about competitive city are premised on cities do compete to each other, however, few scholars do question about it. What is competitiveness? Is it comparison with others? What aim do they want to achieve? The definition of competitiveness is different in several aspects. For companies, it is ability to produce products and service to meet the needs of customers and make maximum profit. For nations, it is degree to extend people’s income and maintain harmony of country with specific conditions within the world (OECD, 1994). For cities, it is an ability to generate better life, better goods, and better investment (Oyelaran-Oyenika, 2013). Very few studies have showed cities don’t compete. Krugman (1995) contends that cities and regions do not compete to each other, they are fields for companies to compete for innovative and creative people and market.Â Nevertheless, Porter (2016), has argued that cities compete to each other. Cities compete in different ways from state-nations, they don’t compete to win trading or assert the territory, which nations-states do. Moreover, it is not like business competition, cities competition doesn’t concentrate on any single object to make the maximum profit. They do compete funds from government, tourism, population of the city, wealth, employment, investment and good reputation across the country or within the world (Begg, 1999; Saez, 2015; Favero, 2016; Ratcliffe, 2006; Stewart, 1996). The prevailing urban policies are concentrated on social circumstances, affordable housing, for example, these are important for cities’ competitiveness (Porter, 1994). Such as, in UK, there was a competition for cities and towns, to elect the best city or town through notable feature, significantly regionally/nationally, historical features and forward looking attitude (UK gov., 2001). The title from the competition may lead lots of effects for the city. Competitiveness of city is deemed performance of city occasionally, and it can present quality of life (Begg, 1999; Rogerson, 1999). Production of city is dynamic measurement for city’s competitiveness. The main key indicators of competitiveness: economics, technological innovation, environment, global linkages, government management, and social cohesion (Ni, 2013). However, most of researches intensify on economics. In Favero’s (2016) paper, he referred that hard economics, such as, cost of labour and employment rate of city are the most common hard economics factors to be discussed in city’s competitiveness. When employment rate is higher than others may mean that the city is more competitive. On the contrary, open urban climate may influence competitiveness and is more like soft economics in urban development. Porter (1998) has stated that environment does affect cities’ competitiveness, economic extension or development may be solution for city growth. In the past, cities could compete for goods and services, due to the fast- changing environment, contemporary, people is crucial element. Florida (2002) has built 3Ts model, which includes technology, talent and tolerance, these three factors attract creative people flow into cities and lead city’s growth. Additionally, Crossa (2016) has asserted that creative city is capable to attract all kinds of professional people turns to be more competitive in this world at present. Cities which are more diverse and innovative may lead inflow of population. Innovative and creative people are fundamental to cities and regions; they are implements to interest firms and investment, lead success and economics growth for the areas (Paas, 2012). Globalization is one of trends in governments, cities are facing some challenges about financial pressure, national security, institutional relations and role of government changing, environmental degradation, cultural and social changing, and lead to borderless, increasing competition and cooperation within cities and regions (Ratcliffe, 2006). Cities can borrow successful ideas and practices from other cities through globalization (Stead, 2012). It may bring legislative and administrative changes of localized institutions and policies, and raise competitiveness in cities and regions. However, while competition is happening, cooperation is acting simultaneously, such as, INTERREG Programme; it is facilitated cooperation by the EU with planners around Europe for their common development. In addition, cooperation between cities and regions can developed by making ‘sister cities’ to build networking and promote cultural notions. Brakman (2015) claims that cooperation by having twinning cities can decrease transaction cost and significantly grow faster, which facilitate cities more competitive. Tosic (2007) also asserts that cooperation may lead stronger competitiveness and strategies of planning. Continuing from INTERREG Programme in Europe aids countries, cities, counties, or regions to address problems and derive experiences and apply new approaches from others, also cope with variety of things from different fields. B-Team, it is one of projects from INTERREG Programme which is about development of brownfield before greenfield land as a principle of continuous growth in Belfast, it was involved 14 partners from 11 different countries ran for three years to regenerate brownfield to be more efficient for communities and aimed to help partners to improve regeneration policies and developed integration of planning process. This project illustrates transferability by publishing to share with others who are interesting in it and may adopt it (B-Team, 2012). Significantly, it has great influence on investment. The participatory urban planning is a method to attract investors, stakeholders and actors to charm their interest and find out innovative solutions and procedures. Cooperation in this project do affect in regeneration process, and learn wider range of implements and manners, additionally, raising competitive in the city. Once city is more competitive, it possesses advantageous position in competitions. Competition between cities and regions has successfully attracted government and investors with forcing local institutions and governance to develop and reform (Lever, 1999). Competitive city generates economic growth and wealth with extending local market, creating opportunities and jobs for commonality, allocating more funds for infrastructures and planning (Oyelaran-Oyenika, 2013). Being competitive attracts creative and innovative individuals and corporations gather. For example, in China, economic boom has been leading strongly influence on construction, which causes more competition between cities. Beijing and Shanghai, two colossal cities were competing the opera houses, which was designed by famous French architect. Contemporary, these constructions have successfully attracted attentions, also brought enormous influence for city (Wyne, 2006). It may lead tourism growth, and economic growth indirectly. The competition can arouse faithfulness and pride of residents and people may understand local authorities’ agenda better. Gospodini (2002) contends there are two parts of cities, which are opposite extremes in European urban system, metropolitan cities and smaller peripheral cities without indigenous resources for development. Rural regions may be more active to competition than urban regions, and try to stand out from it to get more opportunities for region and be more competitive to increase attention in certain competition. However, competition has driven by localized government and institutions, which may lead different results. The Three Sisters competition which is running within Southern Ireland- Waterford, Kilkenny and Wexford, competing the title of European Capital of Culture 2020. The title may bring tourism growth for the county, which lead economic growth in rural and urban area of Ireland. The competition is taking place in 2015 and 2016, which is a long-term form of planning, the result will be released in 2020. For years competing to each other, leading higher reputation and more well known, this title may bring growth of tourism and investment, having impact on economic growth. The reputation of the city would boom in the world, especially in Europe. City would have more funds from national government, retrieve local authorities with economic growth. In order to win the competition, local government may propose some policies for locus’s development. There may be some special constructions or operations to stress on their characteristics, renewing heritages, or re-planning the place. However, there are some issues in rural area, three counties have limited fiscal resources and innovative ideas, which may cause passive operations on promoting. In Waterford city, for example, promotion flags of the competition are hung in city centre, but realistic situation is that few people have heard or weak understanding or confused about the aim of competition. There is no practical action to promote or implement it from localized government. This is a huge problem for regions outside metropolitan area. It is important to courage and regenerate area through central authority’s support on centralized or decentralized planning. Global cities can be seen as competitive cities, which relate to different dimensions in economics, political, informative, cultural, societal, services concepts (Teece, 1990). The overall of global cities’ index in top 25 is assumption of business activity, human capital, information exchange, cultural experience and political engagement. The first bar chart below (Figure 1.1) displays that global elites are London, New York, and Paris which are hub of cultures, politics and economics with strong business activity and performance of labour, creativity (human capital). The top three have massive gap from last three in the ranking, in terms of strong business activities and performance of labour. Globalization forces to transfer into new global economy, which may make different trends of competitiveness, politics, welfare, environment, investment and connectivity with others. To carter to sustain competitiveness, policies should be modified. Sometimes, planning policies hardly identify trends or require long-term periods to adapt it. While technological changes, informational functions are affected and implement of communication within cities and regions, progress equipment may influence progress and service. If city doesn’t follow up technological changes, probably, it would lose competitive advantage in new era. Inflow of migrants is phenomenon of competitive city, extension of population strongly impacts on urban planning, affordable housing, work opportunities, criminal issues, transportation, greenfield, environmental problems, public infrastructures, education, and quality of life. Urban design and planning in competitive city consider about aesthetics objects, environmental dimension, political pressure, economic constraints, residential conditions. Approaches of planning are complex and uncertain, they suppose to adapt into dynamic changes, which means they should be creative and innovative strategies to prepare future changes. The competition between cities and regions do happen, meanwhile, so do cooperation. Both of them are crucial for cities to be global city. Many evidences demonstrate that cities and regions engage with competitiveness and cooperation (Tosic, 2007; Teece, 1990). The department of trade and industry of UK has published a report (2005) about the position in EU, and it clearly asserts that they do support the competition and open market in Europe in order to attract more creative people and investment, and reinforce on innovation and competition. The competition could encourage cities or regions have new ideas, moving forward, becoming different and better. There are more advantages than disadvantages in cities and regions competition, which brings diversity and implementation. If there is no competition between cities and regions, people don’t want to move on, no motivation to improve or change themselves, and no city growth. Less opportunities for city, outflow of population, city will face recession. No one want to get better, city won’t be better and won’t catch the changing world and eventually, be deserted by the world.Â With competitiveness, cities have proven more successful in long term. However, competition and cooperation are acting simultaneously, both are crucial for city growth, it is important to find the balance of them. Anonymous, 2001. UK Government: Fifteen cities compete for grant of a lord mayoralty. Press release, 25 October 2001. AK Kearney, 2016. Global Cities 2016. [Online] Available at: <https://www.atkearney.com/research-studies/global-cities-index/current-research-detail> [Accessed 16 December 2016]. Begg, I., 1999. City and Competitiveness. Urban Studies, [e-journal] 36(5-6), 795-809. Available through: University College London Library website <http://www.ucl.ac.uk/library> [Accessed 25 November 2016]. Brakman, S., Garretsen, H., Oumer, A., 2015. Town Twinning and German City Growth. Regional Studies, [e-journal] 50(8), pp.1420-1432. http://www-tandfonline-com.libproxy.ucl.ac.uk/doi/abs/10.1080/00343404.2015.1023282. Crossa, V., Moore, N., 2016. Innovating to Compete: Dublin as Smart and Creative City. Building Material, [e-journal] 18(1), 84-88. Available through: University College London Library website <http://www.ucl.ac.uk/library> [Accessed 15 December 2016]. Department of Trade and Industry, 2005.Department of Trade and Industry – Departmental Report 2005. [pdf] London: Department of Trade and Industry. Available at: <https://www.gov.uk/government/uploads/system/uploads/attachment_data/file/272133/6536.pdf> [Accessed 10 December 2016]. EU (European Union), 2012. B-Team Final Report: Brownfield Policy [pdf] INTERREG IVC. Available at: <https://www.ioer.de/fileadmin/internet/IOER_Projekte/PDF/FB_L/Final_Report_short_B-Team.pdf> [Accessed 03 December 2016]. Favero, A., 2016. City Competitiveness in Poland: Innovative strategies and local governance in a globalized world – The case of Poznan. [pdf] University of Edinburgh. Available at: <http://www.regionalstudies.org/uploads/Adrian_Favero_-_City_Competitiveness_in_Poland_The_Case_of_Poznan.pdf> [Accessed 02 December 2016]. Florida, R., 2002. The Rise of Creative Class. The Washington Monthly, [e-journal] 34(5), 15-25. Available through: University College London Library website <http://www.ucl.ac.uk/library> [Accessed 29 November 2016]. Gospodini, A., 2002. European Cities in Competition and the New ‘Uses’ of Urban Design. Urban Design. [Online] Available at: <http://www.scholars-on-bilbao.info/fichas/GospodiniJUD2002.pdf> [Accessed 10 December 2016]. Han, S. S., 2005. Global city making in Singapore: a real estate perspective. Progress Planning, [e-journal] 64(2), 69-175. Available through: University College London Library website <http://www.ucl.ac.uk/library> [Accessed 16 December 2016]. Krugman, P., 1995. Competition, cooperation, and innovation: Organizational arrangements for regimes of rapid technological process. Economic Behaviour and Organization, [e-journal] 18(1), 1-25. Available through: University College London Library website <http://www.ucl.ac.uk/library> [Accessed 18 November 2016]. Lever, W. F.,1999. Competitive City In Europe. Urban Studies, [e-journal] 36(5-6), 1029-1044. Available through: University College London Library website <http://www.ucl.ac.uk/library> [Accessed 16 November 2016]. Lever, W. F., Turok, I., 1999. Competitive City: Introduction to the Review. Urban Studies, [e-journal] 36(5-6), 791-793. Available through: University College London Library website <http://www.ucl.ac.uk/library> [Accessed 16 November 2016]. Ni, P., Wei, J., 2013. Global Urban Sustainable Competitiveness: a comprehensive analysis. In: P. Ni, P. K. Kresel, W. Liu, ed. 2015. 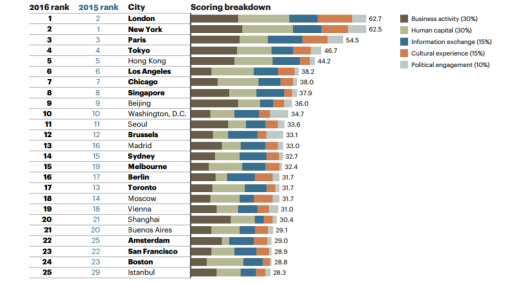 The Global Urban Competitiveness Report – 2013. Cheltenham: Edward Elgar Pub. Ltd. Ch.3. OECD, 1994. Trends in International Trade. OECD Economics Outlook, [e-journal] 56, 38-49. Available through: University College London Library website <http://www.ucl.ac.uk/library> [Accessed 15 November 2016]. Oyelaran-Oyenika, B., 2013. Social and technological innovations in the competitiveness of cities. In: P. Ni, P. K. Kresel, W. Liu, ed. 2015. The Global Urban Competitiveness Report – 2013.Cheltenham : Edward Elgar Pub. Ltd. Ch.9. Paas, T., Halapuu, V., 2012, Economic Growth in the Framework of Florida’s 3T Model: Theoretical Considerations and Empirical Evidence, An Enterprise Odyssey. International Conference Proceedings. Europe, 13-16 June 2012. Zagreb: Croacia. Porter, M. E., 1994. A Competitive Advantages of Far Eastern Business: A Response. Asia Pacific Business Review, [e-journal] 1(2), 1-2. Available through: University College London Library website <http://www.ucl.ac.uk/library> [Accessed 18 December 2016]. Porter, M. E., 1998. Competitive Strategy: Techniques for Analyzing Industries and Competitors. [e-book] New York: The Free Press. Available through: Scribd website <https://www.scribd.com/> [Accessed 18 December 2016]. Porter, M. E., 2016. Inner-City Economic Development. Economic Development Quarterly, [e-journal] 30(2), 105-116. Available through: University College London Library website <http://www.ucl.ac.uk/library> [Accessed 18 December 2016]. Ratcliffe, J., Kelly, R., Gannon, J., 2006. The Competitive Global City 2030: a Future Approach. Future Academy, [Online] Available at: <http://arrow.dit.ie/futuresacart/> [Accessed 02 December 2016]. Rogerson, R. J., 1999. 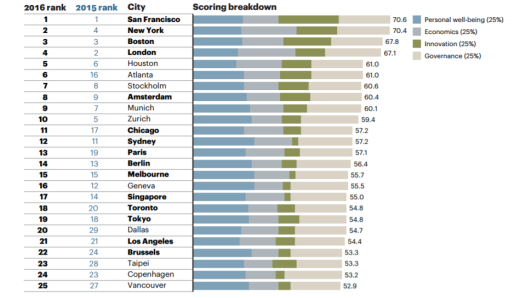 Quality of Life and City Competitiveness. Urban Studies, [e-journal] 36(5-6), 969-985. Available through: University College London Library website <http://www.ucl.ac.uk/library> [Accessed 05 December 2016]. Saez, L., Perianez, I., 2015. Benchmarking urban competitiveness in Europe to attract investment. Cities, [e-journal] 36(5-6), 969-985. Available through: University College London Library website <http://www.ucl.ac.uk/library> [Accessed 05 December 2016]. Stead, D., 2012. Best Practices and Policy Transfer in Spatial Planning. Planning Practice and Research, [e-journal] 27(1), 103-116. Available through: University College London Library website <http://www.ucl.ac.uk/library> [Accessed 18 November 2016]. Stewart, M.,1996. Competition and competitiveness in urban policy. Public Money & Management, [e-journal] 16(3), pp.21-26. http://www-tandfonline-com.libproxy.ucl.ac.uk/doi/pdf/10.1080/09540969609387929?needAccess=true. Teece, D. J., 1990. Competition, cooperation, and innovation: Organizational arrangements for regimes of rapid technological process. Economic Behaviour and Organization, [e-journal] 18(1), 1-25. Available through: University College London Library website <http://www.ucl.ac.uk/library> [Accessed 15 December 2016]. Tosic, I., 2007. City-regions in Europe: The potentials and the realities. The Town Planning Review, [e-journal] 78(6), 775-795. Available through: University College London Library website <http://www.ucl.ac.uk/library> [Accessed 17 December 2016]. Wyne. A., 2006. Chinese cities compete for dynamic opera houses. Architectural Record, [e-journal] 194(7), 38-38. Available through: University College London Library website <http://www.ucl.ac.uk/library> [Accessed 16 December 2016].